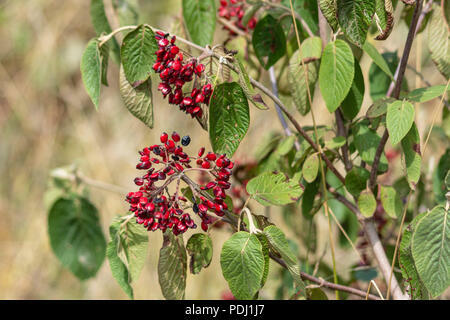 Ok, I am 99% certain this is a viburnum bush - but I cannot find anything with the similar dark red occasional black flattened red berries either viburnum or something else. I am going to go ahead and keyword as viburnum but would love to have a species - or to find out it is something else entirely. There are quite a few bushes all showing the same type of berry where I took these so I am assuming it is a normal berry formation, not some weird one-off.